Okay, I don’t have anything in mind to write about, hence the weird title given by a friend *Black Milk – White Milk* I do take ideas from people on what to write by the way, even if it’s just a plain title with no content, I will come up with the content. Yeah this week is voting week *YaaaY* that comes in because I will wake up early in the morning go vote and get back to bed, or wake up late from my warm cosy bed and go vote later in the afternoon. That’s my plan for that day. Then hoping that the YES vote goes in so that we can extend the holiday to Thursday 🙂 won’t it be one of the best weeks. Yeah my Black Milk, would describe the people saying No to the constitution #TeamNO, because in all ways possible this is the close to perfect constitution we could have with the little knowledge and understanding of it I have of it. I mean it tackles every aspect and tries to better our us as a Country. It’s the white in the milk, but it’s being tarnished and being called black. In that case am on with the White Milk Which is #TeamYES , I will make sure that I have faithfully casted my vote and I pray and hope the constitution comes to be… I would love to see it implemented since that’s where the challenge lies. I mean we could say Yes/No but if no action is done then we remain same old same old. Warembo Ni Yes…is just but one very good initiative, I hope they take it further than just saying YES to the new constitution and have something that would actually benefit women and the economy as a whole. Because as Marylin Monroe says “Give a girl the right shoes and she can conquer the world.” So I take it that, given that the Woman in the new constitution has been given access to power and freedom, I believe that she will work her way towards a better Kenya. And so should the men. 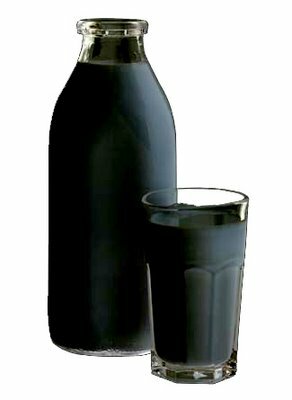 Other than the constitution, the *Black Milk-White Milk* also applies in our lives. I was having a chat with my work mate and just thought of it. We are the rulers of our lives. In this case you can either look at it from the black or white perspective. When you take up the Black Milk, is where you are being unfair and unpure to yourself. By this I mean, you look down on yourself, you do not appreciate who you are, what you do, and the potential that you have in order to be resourceful in this world. You can see yourself as such a small thing in this world but without you something would go a miss. I mean black milk, is just wrong. If your milk ever goes black you must have added reagent of sorts. Just like our personalities and characters, it goes wrong of you become who you are not i.e. copy or try to be like someone else. Just be you, because you are the best you can ever be ~~~ I mean God created you as you for a reason you know. On the other hand, White Milk, would be when you are confident with yourself, you love and appreciate who you are, what you do and you utilize the full potential you have by making use of the available resources…lol did I just say that, blame it on this project management I think this is pure. Just like the milk in its correct/natural state. And I think we should do the same for our characters and personalities regardless of the state we are in, should it be happy, sad, angry, content, proud, desperate, depressed, fortunate or unfortunate. Be blessed my beloved readers.